140NOTE: These instructions only relate to additional workstation Licences purchased over and above the initial EasyDose program. The purchase of the initial EasyDose program includes a license for 1 workstation so if you do not intend to use EasyDose on more than 1 workstation, the information contained within the page can be disregarded. If you wish to increase the number of workstations or extend the licence period beyond 12 months, then the information on this page is relevant. Use this option to increase the number of workstations that can access EasyDose. Visit the EasyDose website and purchase the number of workstation licences required from the Shop. Receive the email with the Licence Key(s) and download link. Install EasyDose on the computer required from the link supplied. Download the EasyDose Setup.exe file from the EasyDose website using the link in the email. Note where the setup.exe file is saved and located. Copy the file onto a USB drive or alike and transfer the Setup.exe file to the required computer. Run the Setup.exe file to install the prerequisites. When the pre-installation is complete, click the install button on the following webpage. Installing on computer from which EasyDose WAS purchased. (PREFERRED OPTION). Click on the link in the email and run the installation process direct from the website. After the prerequisites are installed, install the program from the next webpage. Enter your email address used to purchase the program. Enter the Licence Key received in the email. Use this mode if you already have enough licences but want to extend their expiry date by 1 year. To purchase additional workstation licences, purchase the required number of licences. An email will be received with the installation details, License Keys and links to the setup instructions. Visit the EasyDose website and purchase the number of licences required from the Shop. 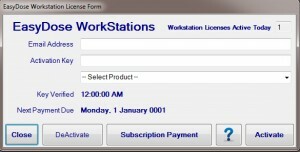 Open the EasyDose Workstations Form from the main menu > File > Add a Workstation Licence. Once entered, click ‘Activate‘ and the process is complete.